Techno shamans from Polar Inertia keep demonstrating their prowess with the third EP on Dement3d, when “Kinematic Optics EP” drops after convincing “Indirect Light” and “The Last Vehicle”, both among most sought-after releases of the Paris label. 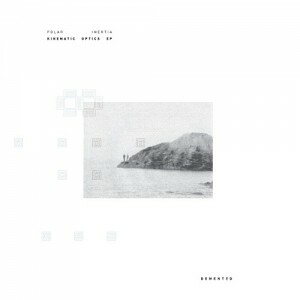 Polar Inertia reports nothing new about their biographical details and it is also irrelevant, seeing how capable they are in creating a well-working blend of trance influences and rugged techno textures. Actually, calling over 73 minutes of music an EP is actually misleading, but vinyl buyers can be only happy about. However, the label quickly realised that the length does not justify the price (€14) asked for the digital release and allocated a discount code on the label’s Bandcamp site. The A/B-side are made for conquering the floor and my favourite is the opener “Floating Away Fire”, which leaves hastily ambient zone for an infectious bass line, industrial thuds and hiss, to form a complex, highly immersive track. Of similar build is “Vertical Ice” and in between “Hell Frozen Over” runs on abrasive synth lead of reminding of Kangding Ray. For Polar Inertia standards, the three-minute title track is a short one featuring a narrative rooted in the illusory world of conspiracies. The other piece of vinyl features two ordinary ambient journeys on the theme “Can We See Well Enough To Move On?”. Totalling about 40 minutes, Polar Inertia goes for a long stretch of experimental and drone passages from a live session at the Abilene Gallery in Brussels.